Pleasant aroma of roasted malts & honey. Frothy head with UNBELIEVABLE lacing. Frothy, rich creamy clumps of delicious foam that stayed after the porter was finished! Like the other Sam Adams (Black Lager & Irish Red) cadavers, this beer is part of the 'Brewmaster's Collection'. This one seals the deal. 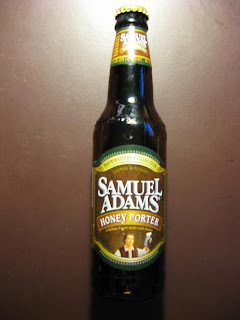 I have had Samuel Adams Lager in the past and wasn't too impressed. I found it dry and a bit gassy. Well, bring on the Brewmaster's collection, cause these have all been winners. I am wowed. This beer had foam in the glass 1/2 hour after I finished the beer. I, the Reaper, couldn't kill it! Oh so tasty...look there's another in the mortuary fridge! Yeah!